Goodreads says, "A girl who can speak to gods must save her people without destroying herself. A prince in danger must decide who to trust. A boy with a monstrous secret waits in the wings. Together, they must assassinate the king and stop the war. In a centuries-long war where beauty and brutality meet, their three paths entwine in a shadowy world of spilled blood and mysterious saints, where a forbidden romance threatens to tip the scales between dark and light. 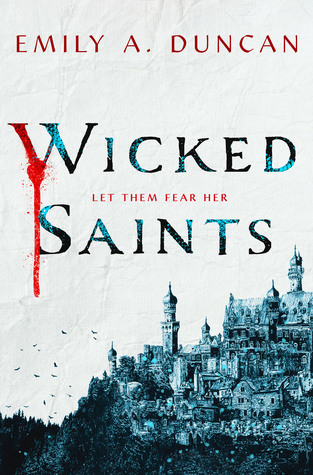 Wicked Saints is the thrilling start to Emily A. Duncan’s devastatingly Gothic Something Dark and Holy trilogy." Nadya lives in monastery in a remote village. She isn't your usual teenager though; she can speak to all the Gods which is rare. The priests know Nadya is special and are hoping she will be an unrivaled weapon in the Holy War, which is why she is training at the monastery. However, before the priests can finish training her training, they are attacked by their enemies. Leading the attack is Serefin, a prince, who can preform dark magic, and holds many secrets of his own. Can Nadya really stop the war and save her people like they all had hoped? Emily A. Duncan's Wicked Saints is an action packed young adult fantasy for fans who enjoy dark magic, adventure, and corrupt kingdoms. Nadya is an interesting character right off the bat in Wicked Saints. I liked that she's fierce, independent, and holds a lot of power. She can talk to not only her patron God, but all the Gods, which makes her a force to be reckon with. Who doesn't love a little girl power? Whereas Serefin was a bit more complex. I did feel badly that he has to deal with his crazy and power hungry father, but I didn't always agree with his decisions. For starters, every time he uses his magic, he has to shed blood. That's right. Blood. Yikes. Chapters alternate from both Nadya and Serefin's perspectives, so readers will get to know both characters well, although I will admit that I had hoped Duncan would have fleshed them out a bit more. The setting, although a little confusing at times, was really unique in Wicked Saints. Duncan created a world that that felt a bit inspired by Russia. The churches, the complex names, the blood magic, and the Gods all added to a memorable and atmospheric setting. So, Wicked Saints was a bit darker than I was expecting. It's pretty action packed and in turn, can be very violent for a young adult novel. There are some definite o-m-g moments and don't get me started about that ending! 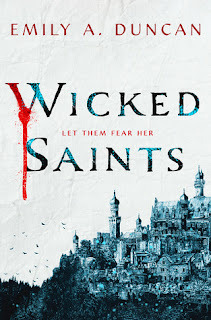 So, if you like your YA fantasies a bit more action packed and cutthroat, definitely check out Wicked Saints. It is the start of a new trilogy that I think fans of darker high fantasies will enjoy. I have had this on hold at the library, and it finally came in recently! I'm super curious to read it. Love your review! I look forward to your thoughts on it! Thanks for visiting, Christy!